Document Signed; Madison (James), 1814, Land Grant. 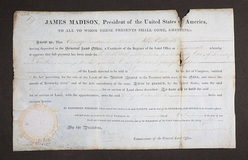 A President James Madison signed land grant; image credit on full record. President James Madison signed land grant, dated April 5, 1814, partially printed, on vellum, with embossed paper label, 8 1/2 in. x 13 3/4 in.